Part of our micro-residency programme, artist Fiona Winning is working in our space in November & December 2015, inviting people living and working in Eastville and in Yeovil to give up a treasured family culinary secret, prepare it and share it. The project is called EastvilleEats and she is looking for anyone interested in taking part to share their favourite recipes and the stories behind them. A celebration event will take place on 19th December 4-7pm to invite the public to join the artist and participants to share tasty ‘gifts’ of generosity in the run up to the Festive celebrations. 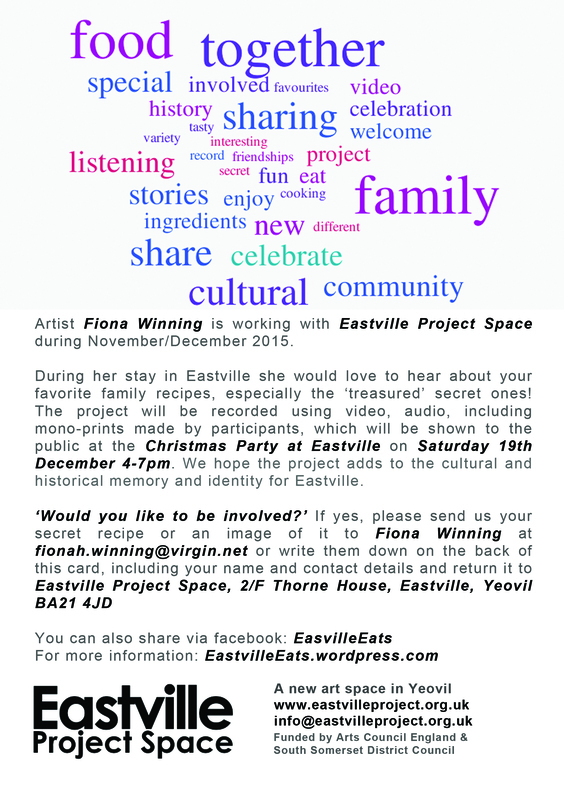 The project will be recorded using video, audio and mono-prints made by participants, which we hope will become part of the cultural and historical memory and identity for Eastville. Based in Bristol/Somerset she is a qualified educator and facilitator experienced in working within community environments. Fiona creates work that combines conversations, social events and art workshops. Her work often provides a positive impact in terms of building communities and instilling a sense of place for residents.